Stens 051-012 Air Table Lift. Width: 48". Height: 30". Technicians increase their job efficiency a minimum of 20 percent to 30 percent with a lift; labor recovery rates increase. No special instruction or wiring required; operates on 100 PSI air supply. Includes: side extensions, hose and foot pedal, 4 ring clips for extension tubes and ramp bolts and nuts. To ensure tool accuracy and personal safety, do not attempt to repair tools. For those shops tight in space. Ideal for quick diagnostics and minor repairs. Lifts up to 1,000 pounds on the 80" long table top. Great for generators, walk behind equipment and snow throwers. Special order item. Please allow additional time for delivery. No cancellations. No returns. Rated lift capacity: 1,000 lbs. Overall width: 24". Overall height full lowered: 7". Appox. depth, front to back: 80". Drop safety/control safety lock: each 1 1/4". Approx. lift time/loaded: 20 seconds. Approx. drop time/loaded: 20 seconds. Maximum supplied air pressure: 100 PSI. Operator controls: foot pedal to raise and lower. 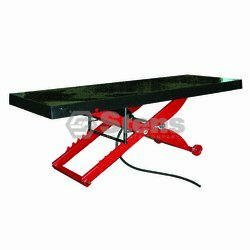 Loading ramp: provided to assist with staging loading equipment onto lifting platform.